Where does the name Q fever come from? What causes Q fever? What is the incubation period for Q fever? Who is at risk for getting Q fever? Are there different forms of Q fever? Does pasteurization prevent the transmission of Q fever? What are the signs and symptoms of Q fever? What types of specialist treat Q fever? 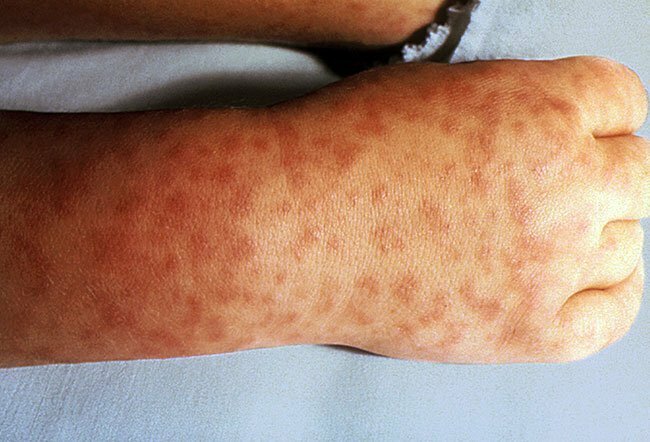 How do physicians diagnose Q fever? What is the contagious period for Q fever? What is the danger of getting Q fever while pregnant? What complications may arise with Q fever? If it is not Q fever, what else could it be? What should people do if they have been exposed to Q fever? Is there any treatment for Q fever? What is the prognosis for Q fever? Is there a vaccine against Q fever? Is Q fever a bioterrorism threat? Where can people find more information about Q fever? Q fever is a highly infectious disease that can cause serious illness. Q fever is caused by a bacterium called Coxiella burnetii; infected animals transmit Q fever to humans. Q fever can occur in an acute form and a chronic form. Q fever can cause complications of pneumonia, hepatitis, endocarditis, vasculitis, and chronic fatigue. Q fever in pregnant women can result in miscarriage or premature delivery. Antibiotics can successfully treat Q fever. Q fever is an uncommon infectious disease. Animals transmit the disease to humans (this sort of infectious disease is called a zoonosis). Most often, cattle, goats, and sheep transmit Q fever, but it can also come from cats, dogs, rabbits, and other animals. Rarely, it's possible for Q fever to spread from person to person. In 2010, there were 131 cases of Q fever in the United States reported to the Centers for Disease Control and Prevention; however, some people with Q fever have only very mild symptoms and so do not seek medical care. Therefore, the actual number of cases is probably larger. In most people, Q fever may cause high fevers, sweating, muscle aches, headaches, cough, chills, nausea, vomiting, abdominal pain, chest pain, and diarrhea. The disease can cause a chronic infection that can result in endocarditis (infection and inflammation of the valves of the heart). In March, 2013, the CDC published the first set of national guidelines for the diagnosis and treatment of Q fever. 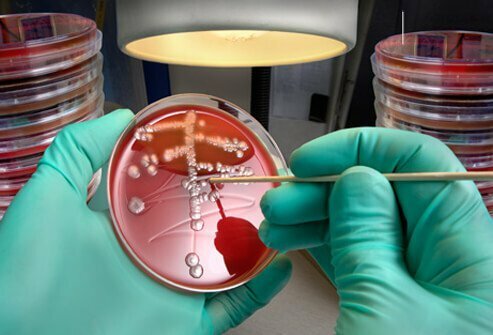 What are the biological agents that can be utilized for bioterrorism? While any germ, bacteria, or virus could potentially be utilized by terrorist, there are a number of biological agents that have been recognized as being more likely to be utilized. The reason for these agents being of concern is based on their availability to terrorists and the ease by which these agents can be disseminated. When Q fever was first identified as a disease in the 1930s, the cause was unknown. The "Q" in Q fever stands for the word query. In 1937, Australian and American researchers discovered the bacterium that causes Q fever, Coxiella burnetii. The bacterium that causes Q fever is found in the waste products (urine or feces) of infected animals. It can also be found in the milk of infected animals. Another main source of transmission is from contact with the placenta and other reproductive products from infected animals. The bacteria can be inhaled or ingested. Rarely, it can be spread through human-to-human contact or through tick bites. The bacteria can live for weeks in the environment. Exposure to just one Coxiella burnetii bacterium can cause Q fever. The incubation period for Q fever is two to 48 days with an average of two to three weeks. People most at risk for Q fever are those who work with the animals that can carry the disease or who live in parts of the world where it is common. Men are more often affected than are women, and adults more often than children. People with weakened immune systems are also at higher risk. Recently, some cases of Q fever have been reported in U.S. military personnel who have spent time in Afghanistan and Iraq. Because the organism that causes Q fever can live a long time in the environment, it can spread via dust particles blown to sites surrounding farms so even people without direct contact with animals can develop the disease. Q fever can present in an acute form and a chronic form. The acute form lasts for a few weeks, while the chronic form lasts for months to years. Q fever can be spread in unpasteurized milk; however, the process of pasteurization kills the bacteria that causes Q fever. About half of all people who are infected with the bacterium that causes Q fever have no symptoms at all. When the acute form of Q fever does cause symptoms, the symptoms can vary from person to person. Most often, people will suddenly develop flu-like symptoms, including fever (as high as 104 F-105 F), chills, malaise, fatigue, muscle and joint aches, severe headache, nausea, vomiting, diarrhea, cough, rash, and chest or abdominal pain. These symptoms may last up to a few weeks. The chronic form of Q fever, which occurs in only about 5% of those people infected, most often causes an infection and inflammation of the valves inside the heart called endocarditis. The symptoms of endocarditis can include fever, night sweats, shortness of breath, muscle and joint aches, edema (swelling of the legs), and rash. Q fever can be treated by any physician; however, it is commonly treated by an infectious-disease specialist. Chronic or severe infections may involve other specialists like cardiologists, cardiac surgeons, pulmonologists, and internists due to organ complications that may develop. Pediatricians and ob-gyn doctors may also be consulted. The diagnosis of Q fever is difficult because the symptoms are very similar to many other illnesses and vary a lot from person to person. The diagnosis should be suspected in people who have risk factors or who live in an area where Q fever is common and present with the acute onset of symptoms. In order to confirm the diagnosis, a blood sample can be sent to test for antibodies to the bacterium. Because antibody levels can remain high for years after a person has been infected, elevated antibody levels do not necessarily mean that the patient is acutely infected. Samples should be sent again a few weeks later to look for changing antibody levels that confirm the diagnosis of acute infection. Samples can also be sent for PCR (polymerase chain reaction) testing, which can detect infection earlier than the antibody tests, but this is less often available. People who have tested positive for acute infection should have follow-up testing done for up to two years to watch for the development of chronic Q fever infection. In chronic Q fever infection, diagnosis can also be made by testing tissue from infected heart valves if they are surgically removed and replaced. Culturing Coxiella burnetii from serum or tissue is possible but requires special lab facilities because of the highly infectious nature of the organism. Once a diagnosis of Q fever is made, it must be reported to the state health department. Q fever is one of the most contagious diseases known and is easily spread from infected animals to humans. As few as one or two bacteria can cause infection. However, human-to-human transmission is rare. Isolation of an infected human is unnecessary. The bacterium that causes Q fever, Coxiella burnetii, can be spread easily from the urine and feces of infected animals, as well as from the placenta of infected animals. The bacterium can survive for weeks in the environment and is contagious the entire time. Q fever is very dangerous in pregnancy. About 80% of pregnant women with Q fever will develop a complication if untreated. The complications range from miscarriage to premature delivery and result in fetal death almost half the time. Pregnant women are also at higher risk for developing chronic Q fever. Women who are infected in their first trimester of pregnancy are more likely to develop complications. With appropriate treatment, the risk of these complications can be minimized. The acute form of Q fever is rarely fatal (1%-2%), and most people get better without any treatment. About 5% of people with acute Q fever will go on to develop chronic Q fever. The chronic form of Q fever is more dangerous. Without treatment, up to 40% of people with chronic Q fever will die, and 100% of people with endocarditis caused by chronic Q fever will die. With appropriate treatment, chronic Q fever causes death in 10% of people. The main complication seen with acute Q fever is pneumonia, which will affect 30%-50% of patients. Another complication can be hepatitis (inflammation of the liver). Rarely, patients can develop myocarditis (heart inflammation), osteomyelitis (bone inflammation), acalculous cholecystitis (inflammation of the gallbladder), and encephalitis (inflammation of the brain). Pregnant women have complications ranging from miscarriage to premature delivery. About 20% of people will have persistent fatigue called post-Q fever fatigue syndrome, which lasts more than a year after the infection. Also, 5% of patients with acute Q fever will go on to develop chronic Q fever. The main complication of chronic Q fever is endocarditis, which will affect 60%-70% of patients. People who already have problems with their heart valves or their immune system are more likely to develop endocarditis. The second most common complication is vasculitis (inflammation of the blood vessels), which is more likely in people who have grafts in their blood vessels. Chronic lung infections and chronic fatigue syndrome can also occur. Endocarditis can cause destruction of the heart valves and result in heart failure. Surgery may be required to repair or replace the valves. Vasculitis, especially in people with grafts or aneurysms in their blood vessels, can also require surgery. Because the initial symptoms of Q fever are shared by many other illnesses, there are a lot of other possible explanations for the symptoms. Influenza, pneumonia, Lyme disease, Rocky Mountain spotted fever, and viral or bacterial meningitis are some other diseases that can have similar symptoms. If someone has been exposed to Q fever but does not have any symptoms, prophylactic treatment (treatment to prevent someone from getting the disease) is not recommended. If someone develops any of the symptoms of Q fever, he or she should be evaluated promptly by a medical professional. Acute Q fever is treated with antibiotic medications (usually doxycycline) for 14 days. Pregnant women with acute Q fever should take the antibiotic trimethoprim/sulfamethoxazole (Bactrim, Septra) from the time of diagnosis until week 32 of the pregnancy. Chronic Q fever treatment is more complicated and generally requires months to years of antibiotics. The prognosis for patients with acute Q fever is very good, with most patients recovering fully within a few weeks to months. The prognosis for patients with chronic Q fever is poorer, with up to 10% of patients dying even with appropriate treatment. There is no vaccine approved in the U.S. for the prevention of Q fever, although there is a vaccine used in Australia to protect humans in certain occupations like those in the sheep industry. Because the organism that causes Q fever is so highly infectious, Coxiella burnetii has been researched as a bioterrorism weapon. The Centers for Disease Control and Prevention (CDC) rate Coxiella burnetii as a class B priority agent, in a classification scheme where class A agents have the most potential for harm and class C agents the least. Excellent information about Q fever can be found at the web site of the Centers for Disease Control and Prevention: http://www.cdc.gov/qfever/. Brooke, R.J., M.E. Kretzschmar, N.T. Mutters, and P.F. Teunis. "Human dose response relation for airborne exposure to Coxiella burnetii." BMC Infect Dis. 13.1 Oct. 2013: 488. Carcopino, X., D. Raoult, F. Bretelle, L. Boubli, and A. Stein. "Managing Q Fever During Pregnancy: The Benefits of Long-Term Cotrimoxazole Therapy." Clin Infect Dis 45.5 Sept. 1, 2007: 548-555. Cleveland, Kerry O. "Q Fever." Medscape.com. Aug. 29, 2013. <http://emedicine.medscape.com/article/227156-overview>. Hartzell, J.D., R.N. Wood-Moris, L.J. Martinez, and R.F. Trotta. "Q Fever: Epidemiology, Diagnosis, and Treatment." Mayo Clin Proc 83.5 May 2008: 574-579. Rotz, L.D., Khan AS, Lillibridge SR, Ostroff SM, and Hughes JM. Public Health Assessment of Potential Biological Terrorism Agents. Emerg Infect Dis. 2002 Feb;8(2):225-30 http://wwwnc.cdc.gov/eid/article/8/2/01-0164.htm. United States. Centers for Disease Control and Prevention. "Diagnosis and Management of Q Fever -- United States, 2013 Recommendations from CDC and the Q Fever Working Group." MMWR 013;62(No. RR-3): 1-32.